The Indian subcontinent is home to Buddhism since it is the place where Buddhism originated and went on to become one of the major world religions. Based on the teachings of Siddhartha Gautam, who was the prince of the ancient Kapilavastu kingdom, which is present-day Lumbini located in Nepal. Our packages serve the purpose of taking you on a complete spiritual journey across some of the most religious sites in the world. Upon your arrival in Delhi our tour representative will guide and transfer you to your allotted hotel by road. The remainder of the day is for performing your leisurely activities where you will relax and spend some time to take in the beauty of this city. At the end of the day you will be served a delicious dinner meal which will be followed by an overnight stay at the hotel itself. After having an early morning breakfast meal in the morning your journey towards Lucknow via train will commence. 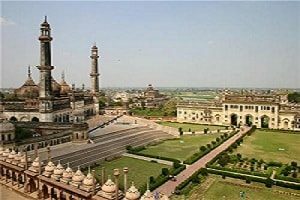 Upon your arrival in Lucknow our tour representative will serve you a delicious lunch meal before starting your journey headed towards Shravasti. Once you arrive there you will be checked into your hotel after which the remaining of the day will be reserved for your relaxation and leisurely activities. At the end of the day you will be served a dinner meal which will be preceded by an overnight stay at the hotel. Early in the morning after having a breakfast meal, you will be taken for a visit to Sahet-Mahet a city located nearby the city of Shravasti which is closely related to the life of Lord Buddha. This is the place where it is believed that Lord Buddha had spent 24 days and performed the largest number of discourses. After exploring this holy city you will then proceed towards one of the most highly significant sites in Buddhism, Lumbini. It is the birth place of Lord Buddha and an important pilgrimage site for Buddhism followers. After your arrival here you will be checked into a hotel. Here you will freshen up and relax for a while and if time or energy allows you have the option of exploring the nearby bazaars and market places. You will also be served a dinner meal along with an overnight stay. This day will be filled with spirituality. After having a healthy breakfast meal in the morning you will head out to visit some of the most sacred and important Buddhist pilgrimage sites in the world. Lumbini is a UNESCO world heritage site which houses the ruins of age old monasteries, bodhi tree as well as an ancient bathing pond complete with Ashokan Pillar and Maya Devi Temple. You will then be transferred by road to Kushinagar where after arrival you will be taken to your hotel where you will relax and freshen up before heading out for a sightseeing excursion of the holy city. This is the place of death of Lord Buddha, and where he attained Parinirvana or also known as nirvana after death. 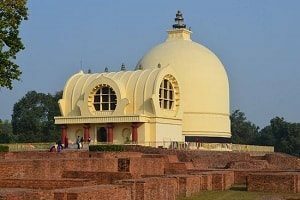 As an international pilgrimage centre Kushinagar holds immense relevance in the life of individuals who follow Buddhism. People from central Asia, Thailand, Korea and Japan make it a point to visit this place at least once in their lifetime to pay their respect to their one and only spiritual and religious leader. Your local sightseeing tour will involve visiting the Nirvana temple or Parinirvana Mandir, which houses a 6.1 metre statue of Lord Buddha lying on his right side. It is said that after 45 years of preaching Buddhism, Lord Buddha took his last breath at this very spot. Your next stop will be Ramabhar stupa which is the cremation centre for Lord Buddha and often times pilgrims and monks can be found there meditating and offering their prayers all along the path leading up to the main structure. After having a day packed with spiritual magic you will be taken back to your hotel for an overnight stay which will be preceded with a delicious dinner meal. After having a hearty and healthy breakfast in the morning you will proceed towards Patna. En route you will be made to visit Vaishali, which is closely associated to Buddhism. It is said that Lord Buddha visited here for his spiritual training from Uddaka Ramaputta and Alara Kalama and after attaining enlightenment he frequently visited this place. Upon your arrival in Patna you will be checked into a hotel where you will be served dinner along with an overnight stay here. 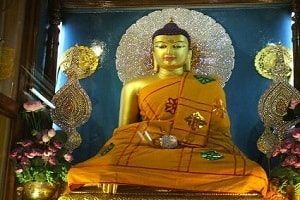 In the morning time after having a delicious breakfast meal you will be taken to Bodhgaya, the place where Lord Buddha attained his enlightenment. En route you will be made to visit some of the major Buddhist sites like, Nalanda, which is a large Buddhist monastery and served as a learning centre in ancient Magadha. A UNESCO world heritage site, this place was fully functional between the years of 5th to 1200 century. Learners from far-away lands of Japan, central Asia, China and Thailand flocked this site in order to learn the highly formalized Vedic learning’s. Your next stop, en route will be Rajgir, which is believed to be Lord Buddha’s one of the favorite places where the atanatiya conference took place at Vulture’s peak. A visit here is supposed to enrich your soul in Buddhist spirituality. Once you arrive at Bodhgaya you will be comfortably checked in to your allotted hotel where you will be spending the night after having a delicious dinner meal. The whole day is reserved for exploring this ancient city. After having a fulfilling breakfast meal you will then be escorted to one of the most important Buddhist pilgrimage site of Mahabodhi Temple. A UNESCO world heritage site this ancient temple was built by emperor Ashok as a way of paying his respects to Lord Buddha. The site is also home to the famous Bodhi tree, under which Buddha attained enlightenment making this site an important pilgrimage destination among Buddhism followers. It will take an entire day for you to explore the temples and the bodhi tree area after which you will be taken straight to your hotel for having dinner along with night stay there. Early in the morning, post breakfast, you will be taken by road to Varanasi. Once you arrive there you will be checked into your allotted hotel where you will freshen up and relax for a bit before proceeding outside for a small Sarnath excursion. Sarnath is located near the confluence of Rivers Ganga and Varuna along with being an extremely important site for Buddhists. The deer place here is the exact place where Lord Buddha taught his first Dhamma i.e. gave his first sermon. After the end of the day you will be taken back to your hotel for an overnight stay along with a delicious dinner. 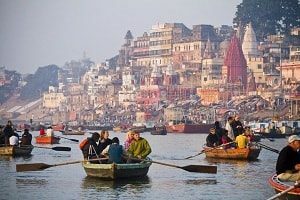 Early morning is reserved for breakfast after which you will be taken for a morning boat ride on the River Ganga. You will then be dropped to the airport from where you will board the flight to New Delhi. Once you arrive in Delhi you will be comfortably transferred to your allotted hotel where you will spend some leisurely time by relaxing. This is the final day of your trip where you will be dropped at your preferred location which will either be an airport, bus stand or railway station from where you’re onwards journey to your destination will commence.